BLACK ROCK ELEMENTARY - New 56,719 SF elementary school and 10.92 acre site developments including full utility, parking lot, site irrigation, landscaping and playground equipment. PLUM CREEK ACADEMY - New 14,500 SF academy for students grades 6-12 with special needs. Distinct features include an emphasis on daylighting and placement of mechanical units to create quiet classroom environments. NIWOT HIGH SCHOOL RENOVATION - 166,473 SF renovation and 13,072 SF addition, including new classroom additions, renovation of existing interior, site renovations, technology upgrades, and a new fire suppression system. UNIVERSITY HILL ELEMENTARY SCHOOL - 2,330 SF addition and 6,184 SF renovation. Scope of work includes art and music facilities and more space for administrative offices to be added to the school, originally built in 1905. Also includes interior finish upgrades, roof repairs and improvements to the fire alarm, intercom and security systems, and upgrades to outdoor recreational areas. MONTBELLO FIELDS - Mechanical, electrical and site renovation of 6 schools, including the Montbello High School synthetic turf football field. DPS McGlone Elementary Addition - 18,000 SF addition to an existing elementary school. We will create 9 new classrooms, new circulation space, restrooms and additional storage. WHITTIER ELEMENTARY SCHOOL - 10,200 SF addition and 9,145 SF remodel. Originally built in 1882, Whittier is a designated Historic Landmark as Colorado's oldest continually operating school. Art, music and kindergarten classrooms and a new computer lab were added. Also included a gym expansion, kitchen improvements, interior finish upgrades, and upgrades to outdoor recreational areas. FAIRVIEW HIGH SCHOOL - 9,000 SF renovation and 7,600 SF addition to the existing school. Scope included classroom renovations, remodeling of the senior balcony and counseling offices, locker replacement and construction of a new 2-story classroom addition. This project incorporated sustainable building elements such as recycled materials, efficient fixtures and systems and low-emitting paints. 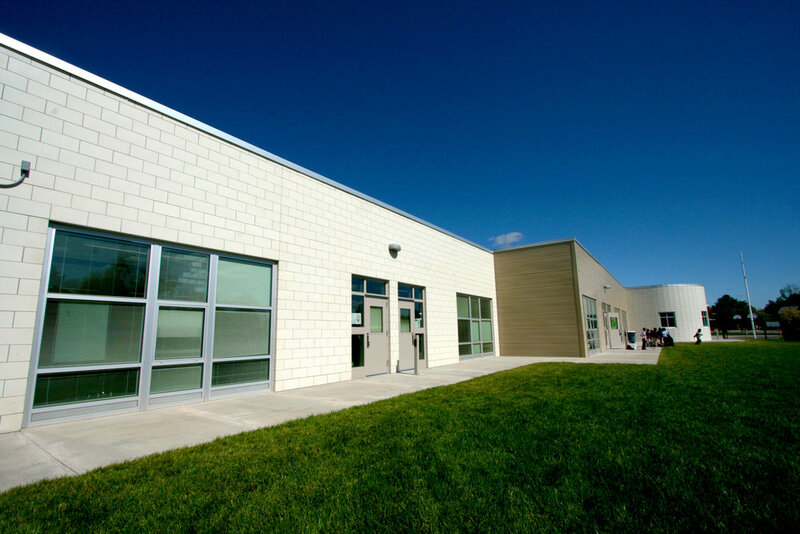 ROXBOROUGH INTERMEDIATE SCHOOL - A new 66,864 SF, 2-story elementary school with crawlspace/basement. This project incorporated sustainable building elements such as motion-sensor faucets, high efficiency HVAC equipment, exterior solar shading and construction waste recycling. ALICIA SANCHEZ ELEMENTARY SCHOOL - Addition of approximately 5,400 SF of classrooms and renovation of the existing 60,882 SF building. This project required close attention to sequencing so as not to interrupt the school, since it was in session while the addition was being built.